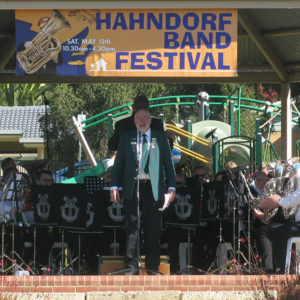 Bands have been part of the town of Hahndorf for a very long time. The Hahndorf Town Band can trace its antecedents back into the middle of the 19th century. 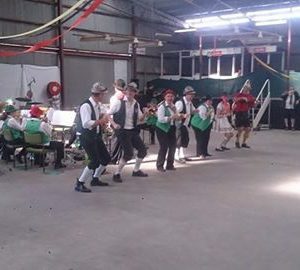 Groups such as the Wiese-Pade Band, the Hahndorf Blaserchor, the Pinky Band, and the Hahndorf Brass Band make appearances in the historical record. However, these groups (and other Hills bands, such as Dalwood’s Band, the Hills Central Band, and the Mt Lofty Band) all eventually dissolved. It was not until 1924 that interest in forming another town band was kindled. By that time, Hahndorf itself had ceased to exist. It was in November 1924 that the Ambleside Town Band gave its first performance at the Hahndorf School’s picnic day. There is a wonderful story about the band’s first rehearsal – that instruments were placed on a table in the Hahndorf Institute and each player was invited to choose an instrument to play! Bill Symonds, the bandmaster of the Port Adelaide Band led the first ‘learners nights’ – apparently much learning needed to be achieved! Later in the year, the first official bandmaster – Stan Petersen, was appointed. Miss Martha Jaensch gifted the band its first property, on which the Band’s Rotunda was built. 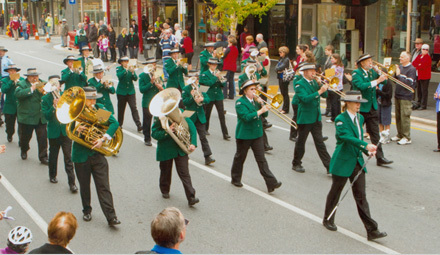 This endowment – the provision of a freehold home for the band – has continued to secure the Hahndorf Town Band’s existence over the years, and continues to be a gift that gives, even today. The original rotunda’s foundation stone was laid by her on 8 June 1935, and the facility was opened by Bill Symonds on 12 October that year. 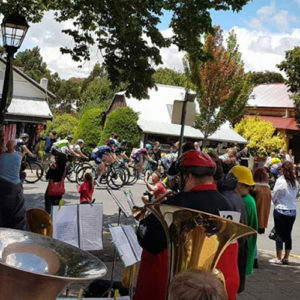 Ambleside again became Hahndorf in late 1935, and it was the Hahndorf Town Band that took the stage in the 1938 Nuriootpa Band Carnival – the Band’s first contest appearance. The following year, Dickie Ballard became Bandmaster and enjoyed a 16 year tenure in this position. Jeff Faehrmann followed him with a tenure of equal length. It is interesting to note that, in the Band’s first 50 years, there were only 100 members. The band was small, but its membership was very stable and committed. Unlike other activities, the Band continued to function during World War II. However, many members volunteered and served, and it is acknowledged here with respect and gratitude this contribution to our nation and our world by these past members. Two paid the supreme sacrifice – Fred Balleine (sunk on the HMAS Parramatta) and Jimmy McFaden (a spitfire ace, shot down on his way home to Australia). Their families have never forgotten them and were thrilled to know that the Hahndorf Town Band, after so many years, still remembers. Lest We Forget. As a contesting band Hahndorf has, historically, sat very comfortably in C Grade, but contested B Grade between 1960-64. Time has also been spent in D Grade over the years. In the days when the Tanunda contest was, essentially, of national championship standing, Hahndorf won the marching contest in 1956 and 1960. On the latter occasion, Hahndorf were two points ahead of its nearest rival, and beat 18 other bands, including four bands from interstate. The Drum Major for these triumphs was the legendary Hahndorf Drum Major of 35 years, Glen Faehrmann. 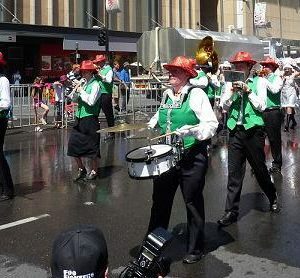 From the late 1990s, the Band has enjoyed successes in handicap entertainment contests, winning at the Adelaide Band Festival and at the Tanunda contest in 2003, where the Band in D Grade played so well as to beat all the opposition C Grade bands off scratch, and won the contest against all others. The junior training band has been a successful initiative of the Band, and boasts several of its graduates as current playing members of the senior group. After nearly 40 years of operation, and many competition successes, the youth band and associated development program continues as a key strategy for assuring the future of the Band. 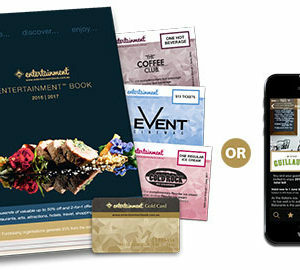 In more recent times, the Band has made its first interstate contest appearances (at Ballarat 2002,03,04), and its second appearance at the National Championships (2005 – the first occasion was the Tanunda Nationals in 1957). The Band placed 5th from 12 bands, and were placed ahead of all other SA bands in the grade. In 1971, the Highways Department announced its intension to resume the Band’s land. By 1974, a new purpose built home for the band had been built in Balhannah Road. The hall is a comfortable and happy home – a focal point for music in the local community. It was built largely with voluntary labour. In 1974, Denise Collins was appointed Drum Major – quite possibly she may have been the first female drum major to lead an established brass band in this country. Like Glen Faehrmann before her, she was a Champion Drum Major of this State at Tanunda. The current Drum Major, Al Kidney, was the 2005 State Champion. 1974 was the year that the annual Musikfest was first held, and this annual tradition continues today. The Band was assisted by Mitcham, K&N, and Campbelltown bands for the Musikfests in 1989 and 1990. In 1992, Glen Jacobi was appointed Music Director and brought youth, vigour, enthusiasm, and passion to the band. He re-established a positive ‘can-do’ culture that has always been a characteristic of this band and its membership. 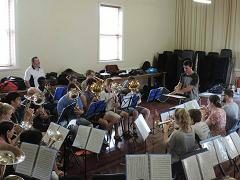 Hahndorf Town Band remains as it has always been – a band with a can-do belief in what is done, and what can be achieved. The Band has received its help not so much from governments, councils, or bureaucracies, but from the contributions of people – time, expertise, in-kind support, and goodwill. The Band has given much in return – in times of war and peace – to the community in the form of entertainment, enjoyment, and opportunity for individual growth and development. Importantly, our members have been at the centre of the fun – all have benefited in so many ways through their involvement in the Hahndorf Town Band.